Please make a tax-deductible donation to the SAC to help us promote the Declaration. We count on your support to continue our work. Make a qualifying donation and receive a limited-edition Declaration poster like those used in signing ceremonies (details below). 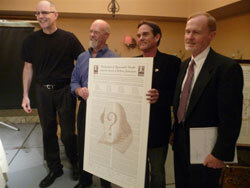 Donors of $40.00 or more ($50.00 outside the U.S.) are eligible to receive a limited-edition Declaration poster like the one in the photo shown above. These are large (24¾" x 39"), museum-quality posters on 80# Strathmore Cover Wove - Soft White paper, with dark brown print, sepia-toned Droeshout engraving images, and lines at the bottom for ten dated signatures. To receive a poster, make a qualifying donation by either of the above methods and either include your request with your mailed donation, or in an email to us. Be sure to include your mailing address. The tax deductible amount will be the amount of your donation less the $20.00 estimated value of the poster.